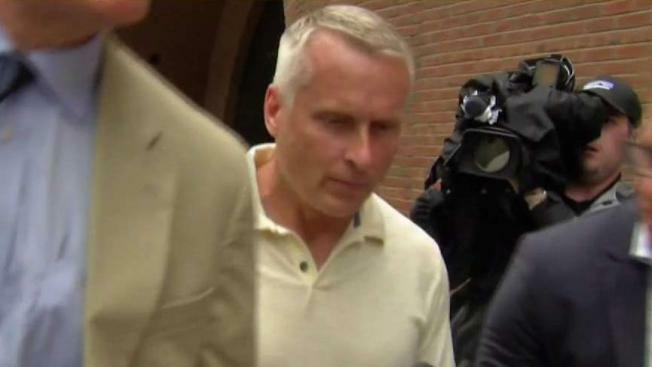 A fifth Massachusetts State Trooper was arrested and charged Wednesday in connection to an overtime abuse scandal that federal authorities have been investigating. Massachusetts State Police said they have temporarily relieved four more troopers of duty in the ongoing overtime pay scandal that continues to rock the department. The agency said its ongoing audit has identified discrepancies between overtime pay earned and actual hours worked for the four department members in question. Internal affairs cases have been opened for the four troopers and the information has been referred to state and federal prosecutors for potential prosecution. Internal hearings have also been scheduled to determine what their duty status will be while internal and investigations into their overtime shifts are conducted. A total of 46 troopers are now under investigation in connection to the overtime scandal and several are facing criminal charges as part of a wide-ranging federal investigation. The latest cases stem from traffic enforcement shifts the four were assigned to work when they were members of the former state police Troop E, which was responsible for patrolling the Massachusetts Turnpike and the tunnels. "Today’s actions are the result of our continued review of records and data indicative of whether Department members were present and working overtime shifts for which they were paid," said Col. Kerry A. Gilpin, superintendent of the Massachusetts State Police. "Our commitment to the public, and to the vast majority of Troopers who conduct themselves with integrity and dedication to duty every day, is to identify anyone who has violated their oath, and we continue to do just that." The audit of overtime traffic enforcement shifts is continuing amid other reforms, including the installation of GPS systems in cruisers, regular audits of the 50 highest earners and a pilot program for body cameras expected to be in place by early next year. According to a Boston Globe report published Monday, state police internal affairs investigators saw warning signs of the overtime pay scandal years ago, yet the agency failed to act. Investigators in 2014 were looking for evidence that two troopers were secretly escorting funeral processions and taking cash under the table, but during that probe they found that troopers had routinely filed for more than 30 hours a week in overtime and paid details they either didn't work or didn't complete, according to internal files reviewed by the newspaper. Those details never made it into the investigators' final report. A state police spokesman said he was "unaware of any systemic response" to potential overtime discrepancies pinpointed in agency audits.